Question groups are a great way to reduce the load on your support or sales team by pre-qualifying visitors with a series of questions. A question group can ask visitors multiple questions and, depending on their answers, either let them chat in a particular widget or show them the offline form. 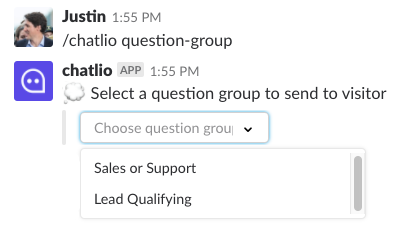 As an example, your question group could start by asking “Is this a sales or support question?” when visitor opens the chat widget, and then route the chat to your support or sales channel in Slack depending on their answer. This is an internal name for this question group, it will never be shown to visitors. For example, you might call a group of questions “Lead qualifying”. Enable this option to trigger the question group automatically when the visitor first opens this Chatlio widget. Any message that you enter in this field will be shown to the visitor at the beginning of the question group. This field can also be left blank if you do not wish to have a message at the start of a group. Let’s say you’ve got two Chatlio widgets, one connected to your sales team in the #sales channel, and the other connected to your support team in the #support channel. 1) You need sales and support chats routed to the correct channels, so you first need to ask visitors if it’s a sales or support request. 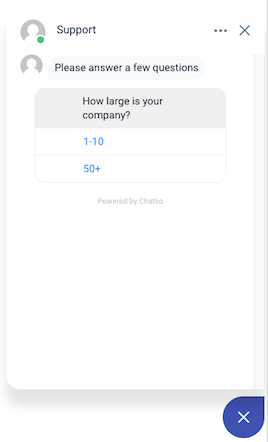 2) Next, you want to ask people who select ‘Sales’ to answer one additional question “How large is your company?” but you only want to let them chat if they select the answer ‘10+’ otherwise, let them leave an offline message. If you have any questions or feedback, don’t hesitate to contact us below via our chat widget!